The possible fates of the universe. 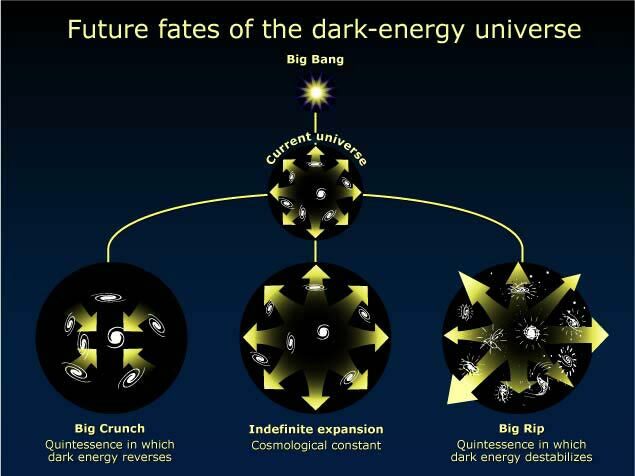 Unstable dark energy could cause a "big rip" (the universe expands violently, then the stars, planets and atoms come unglued) or a "big crunch" (the universe implodes or compresses). In the standard model of cosmology, the universe is comprised of the following; 4% normal matter, 23% dark matter and 73% is dark energy. Dark energy is theorized to be a form of energy that occupies all of space and is responsible for the accelerated expansion of the universe. There are many explanations for dark energy. One of them is that dark energy is a property of space. This is called vacuum energy. It explains that the presence of space, even empty space means the presence of energy. And that the bigger space there is, the more energy is present. Because of the presence of more energy, it would cause the universe to expand faster and faster. Vacuum energy is the most popular explanation for dark energy. Albert Einstein is credited with the realization that empty space is not really empty. His gravity theory, the version that contains a cosmological constant, makes a second prediction: "empty space" can possess its own energy. This ties up conveniently with the vacuum energy explanation. Dark energy makes up about 70 percent of the current content of the Universe and thus holds the ultimate fate of our Universe. Several possible scenarios are possible depending on the properties of dark energy; one is that the Universe will end in a so-called big rip. This interesting topic was recently explored by five researchers from the University of Science and Technology of China, the Institute of Theoretical Physics at the Chinese Academy of Sciences, Northeastern University, and Peking University. Their work, entitled "Dark energy and fate of the Universe", was published in Sci China-Phys Mech Astron 2012, Vol. 55 No. 7. For millennia, human beings have been pondering two ultimate questions: "Where do we come from?" and "Where are we going?" Over that time, these questions have spurred theological and philosophical debate. Thanks to the rapid development of modern cosmology in the past three decades, scientists nowadays have obtained some important clues to answer these questions. The standard "inflation + hot big bang" framework has been developed to explain the origin of the Universe. However, to forecast the destiny of the Universe, researchers have realized that the nature of dark energy is key. In the absence of a consensus on what dark energy is, a phenomenological description of the equation-of-state parameter w—the ratio of pressure and density of dark energy—provides an important means for investigating dark energy dynamics. Properties of dark energy will decide the ultimate fate of the Universe. In particular, if w<-1 at some time in the future, dark energy density will grow to infinity in finite time, and its gravitational repulsion will tear apart all the objects in the Universe. This "big rip" (or "cosmic doomsday") scenario is the major focus of the paper. "We want to infer from the current data what the worst fate would be for the Universe", said the authors. To foresee that fate, it is important to choose an appropriate parameterization that covers the overall expansion history of the Universe. The most popular Chevallier-Polarski-Linder (CPL) parameterization, in fact, is not suitable in predicting the future evolution of the Universe because in this form w will diverge when the redshift parameter approaches -1. Thus, the authors invoke a divergence-free parameterization, called the Ma-Zhang (MZ) parameterization, to predict the evolution of the Universe. One of the more intriguing questions is: "If a doomsday exists, how far are we from it?" After constraining the MZ parameter space via a Markov Chain Monte Carlo method, the authors found that by using the current observational data tBR – t0 = 103.5 Gyr for the best-fit result, and tBR – t0 = 16.7 Gyr at the 95.4% confidence level (CL) lower limit. Here tBR denotes the time of the big rip, and t0 denotes the present day. "In other words, at worst (95.4% CL), the time remaining before the Universe ends in a big rip is 16.7 Gyr", said the authors. Thus the constrained parameter space indicates that it is very likely that in the future w<-1. If so, one may ask another interesting question: "How about the destinies of the gravitationally bound objects in the Universe, such as galaxies and stars?" In fact, if w indeed ever becomes less than -1, dark energy's gravitational repulsion will continuously increase until it overcomes all forces holding objects together and all objects will be torn apart. No object would escape this fate, but obviously systems more tightly bound would exist for longer. Using the MZ parameterization, the authors speculated on a series of possible consequences before the cosmic doomsday. For example, for the worst situation, namely the 95.4% CL lower limit, the Milky Way will be torn apart 32.9 Myr before the big rip; two months before doomsday, the Earth will be ripped from the Sun; five days before the doomsday, the moon will be ripped from the Earth; the Sun will be destroyed 28 min before the end of time; and 16 min before the end, the Earth will explode. However, from what we already know of the dynamical properties of dark energy, one thing is all very clear, we still have a very long future ahead.